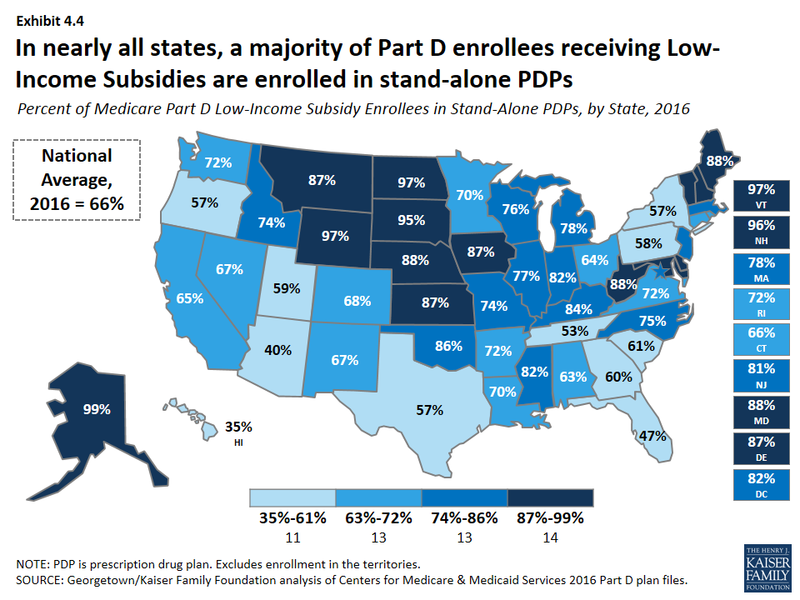 Nearly three in 10 Part D enrollees receive additional financial subsidies for Part D coverage through the Low-Income Subsidy program. 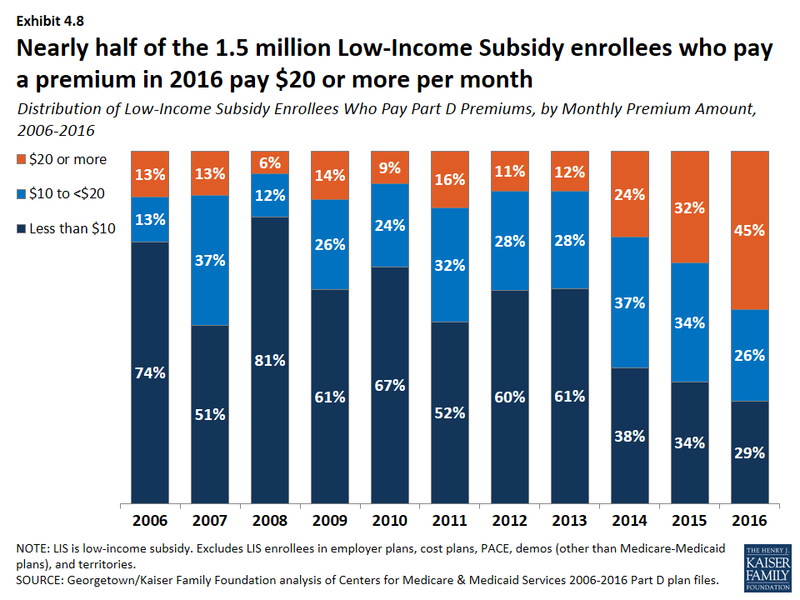 About 12 million Part D enrollees (29 percent of all Part D enrollees) receive additional subsidies through the Low-Income Subsidy (LIS) program (also called “extra help”) (Exhibit 4.1). The LIS pays Part D premiums for eligible beneficiaries, as long as they enroll in PDPs designated as benchmark plans, and also reduces cost sharing. About two-thirds of LIS enrollees (66 percent, or 8 million) are enrolled in stand-alone PDPs; others are in standard MA-PD plans, Special Needs Plans (SNPs), Medicare-Medicaid plans participating in financial alignment demonstrations, cost plans, or PACE plans (Exhibit 4.2). 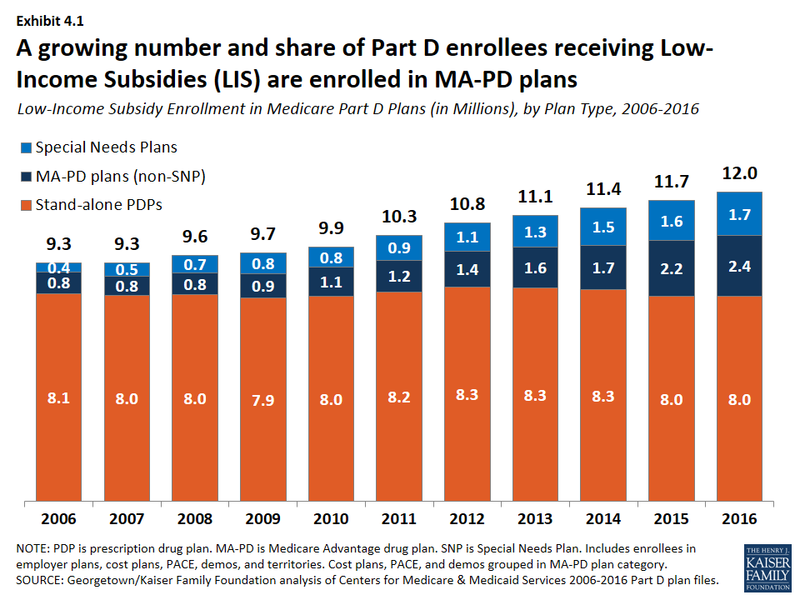 PDP LIS enrollment has been relatively constant since the program began, but MA-PD plan enrollment (including enrollment in SNPs) has more than tripled since 2006. 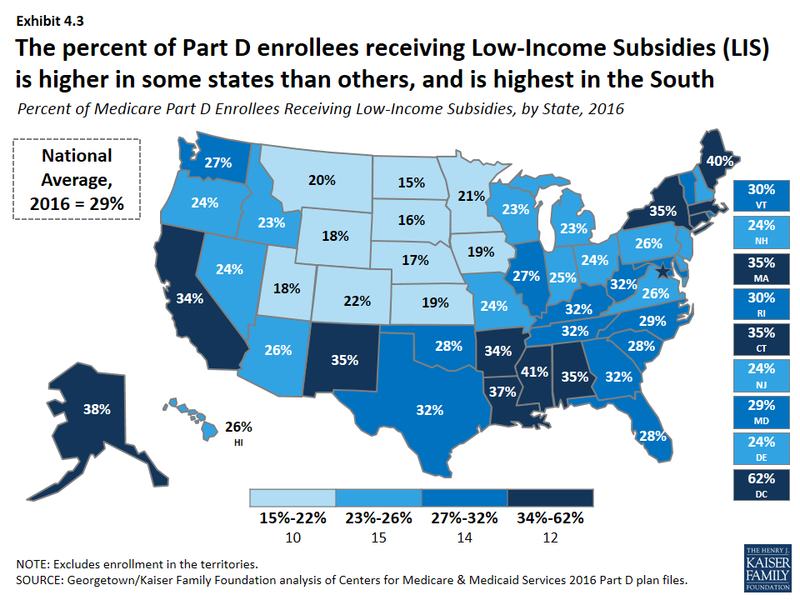 The percent of Part D enrollees receiving LIS is higher in some states than others, and tends to be higher in southern states than in other regions of the country (Exhibit 4.3). 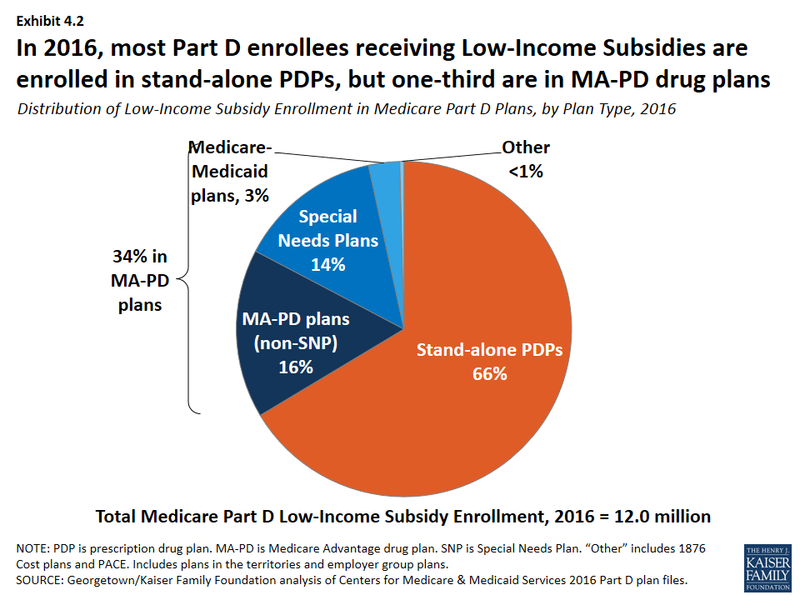 In three states (Arizona, Florida, and Hawaii), more than half of LIS enrollees are in some type of MA-PD plan (Exhibit 4.4). In six states, more than 95 percent of LIS enrollees are in PDPs. 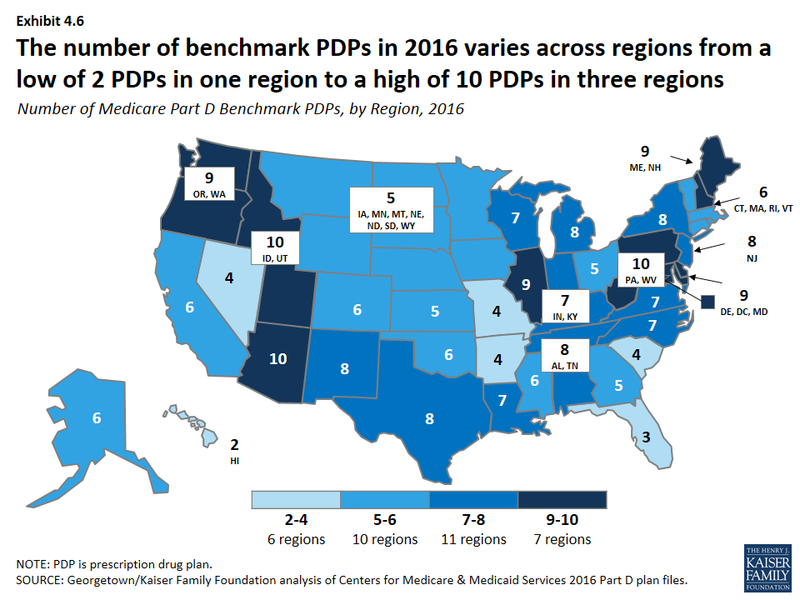 Fewer PDPs qualify as benchmark plans in 2016, compared to any previous year. In 2016, 226 PDPs nationwide (about one-fourth of plans) qualify as benchmark plans; that is, plans that are available to beneficiaries receiving the LIS for no monthly premium (Exhibit 4.5). This represents a 20 percent reduction in benchmark plans since 2015. In 2016, the average LIS beneficiary has a choice of seven benchmark plans, fewer than any previous year. About one-fourth of benchmark PDPs in 2016 qualify through a policy that allows plans to waive a premium of up to $2 per month. Benchmark plan availability ranges by region in 2016 (Exhibit 4.6). LIS beneficiaries have a choice of 10 benchmark plans in three regions (Arizona, Idaho/Utah, and Pennsylvania/West Virginia), but just two benchmark plans in Hawaii and three in Florida. Some LIS beneficiaries pay premiums, even though they are eligible for premium-free Part D coverage; of the 1.5 million LIS enrollees paying premiums, close to half pay $20 or more per month. In 2016, about 13 percent of all LIS beneficiaries (1.5 million) pay a premium because they are not enrolled in benchmark plans (Exhibit 4.7). 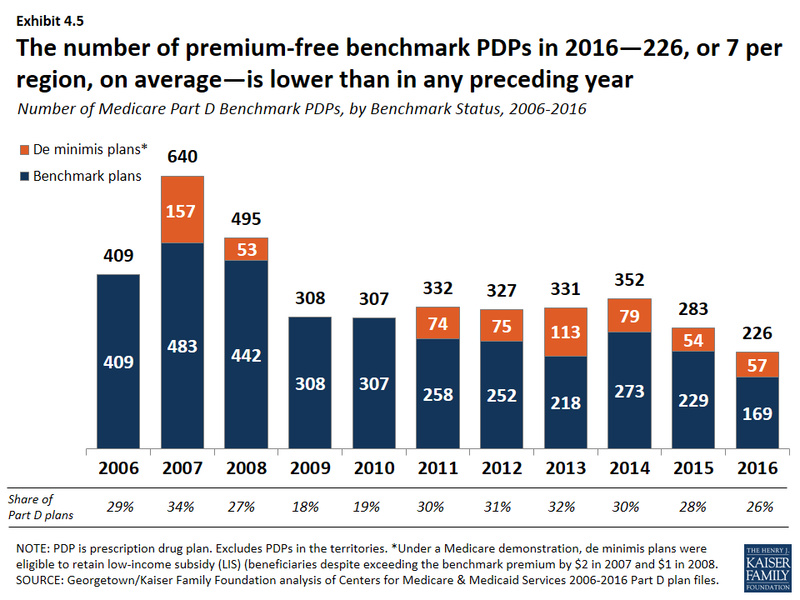 CMS reassigns some beneficiaries to a zero-premium PDP during open enrollment if their previous PDP loses benchmark status and charges a premium. But these LIS enrollees are not reassigned by CMS because they have actively selected the plan they are in, whether it is a PDP or an MA-PD plan. 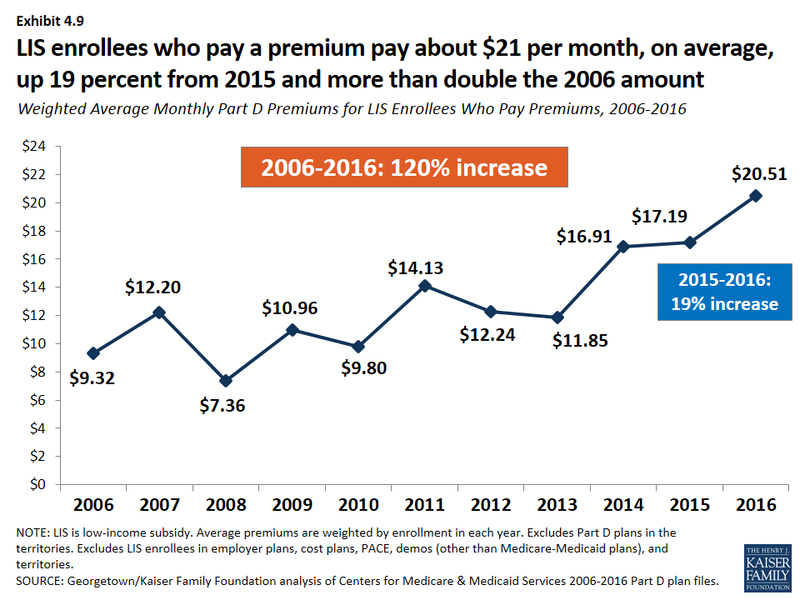 The number of LIS beneficiaries paying premiums is currently lower than in 2009 and 2010, at least partly because of the policy that allows plans to waive premiums up to $2 per month. 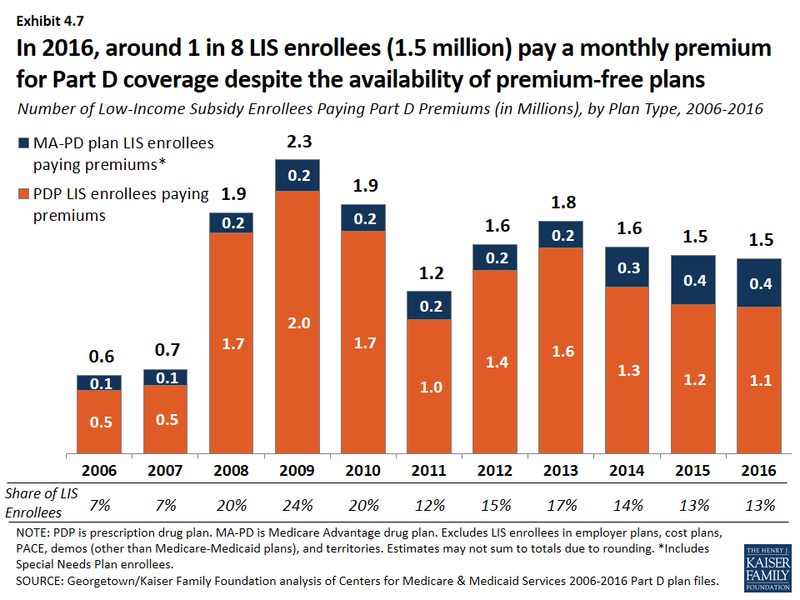 In 2016, 71 percent of the 1.5 million LIS enrollees who pay a premium for Part D coverage pay $10 or more per month (Exhibit 4.8). Almost half (45 percent) of the 1.5 million LIS enrollees who pay a premium pay $20 or more a month for their Part D coverage. On average, the 1.5 million LIS beneficiaries paying Part D premiums in 2016 pay $20.51 per month ($246 per year) (Exhibit 4.9). This amount is up 19 percent from 2015 and is more than double the amount in 2006.